I've been fortunate to have Grey Means Go articles published in a variety of forms over the past few weeks, both local to international. 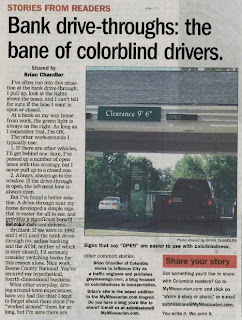 My hometown newspaper in Columbia, Missouri, published a recent Grey Means Go blog on the bank drive-thru experience. In addition to the paper copy, the article is available on a website they've devoted to local writers: My Missourian. 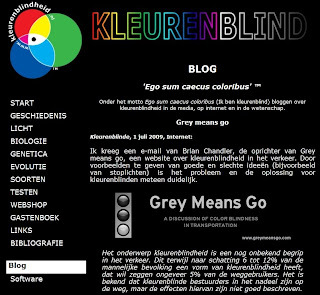 At the other end of the spectrum, a colleague from The Netherlands recently translated a Grey Means Go article to Dutch and posted it to his website, Kleurenblind. Jurjen van Bolhuis has developed a site discussing colorblind issues in his country and around the world. 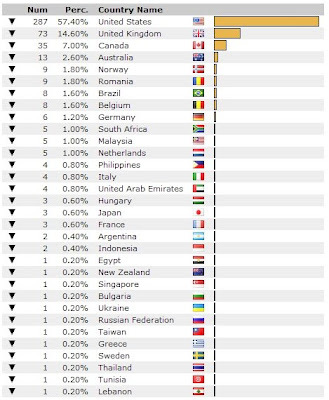 I took a look at the readership of Grey Means Go and discovered the site has readers all over the globe. Of the last 500 page loads, 42% came from outside the United States, from as far away as Egypt, Singapore, and Lebanon. These recent examples have urged me to think more about the global community and content sharing across languages. It seems that expanding beyond English-speaking readers is an important step to promote growth. I am embarrassingly mono-lingual, but I hope to learn more about available tools to share the message of Grey Means Go more effectively around the world.